With simple copy and paste embed code, you can easily add Turbo Brochures to your website. 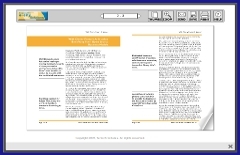 Turbo Brochures can even be sent in emails or newsletters. In addition to the website embed code, you also receive a link, direct to your brochure, that you can send to everyone. For each brochure, you can either close the Turbo Brochure window or redirect the visitor to any website url. Each brochure can even have there own unique setup. See the window redirect feature in action. See the window close feature feature in action.